The nucleus of a formidable Oakland Oaks team that captured the 1948 Pacific Coast League title was commonly referred to in the media as “the nine old men.”1 The roster included such notable ex-major leaguers as 40-year-old Ernie Lombardi and Cookie Lavagetto and Billy Raimondi — both past 35. Relative youngsters (at 34) included Jim Tobin, Nick Etten — and first baseman/outfielder Les Scarsella, whose modest big-league career had ended in 1940. California native Leslie George Scarsella was born in Santa Cruz on November 23, 1913, the second child of John and Lena Scarsella, both of Italian ancestry. John worked for the Hercules Powder Company, a dynamite factory located in Pinole, while Lena tended to their growing family. 2 The 1930 census listed their children as Harry, 19, Leslie, 16, Bernice, 11, and 2-year-old Lois. Les lettered in three sports at Richmond High School, serving as captain of both the basketball and baseball teams. Awarded a scholarship to attend St. Mary’s College, he soon dropped out to pursue his dream of playing professional baseball.4 Left-handed all the way, Les stood 5-foot-11, weighing 185 pounds; despite his stocky build, he was reasonably quick on the base-paths. Signed in 1934 by Cincinnati Reds scout Charles C. Chapman, the 20-year-old made his professional debut in the class B Piedmont League, hitting .268 and slugging .368 in 109 games for the Wilmington Pirates. Returned to Wilmington in 1935, Scarsella improved to .356 in 134 games. The team finished in second place, with first-sacker Les earning all-star status. Cincinnati rewarded the youngster with a late season call-up; he batted .200/.385/.300 in six games. Ann was an attractive young woman, possessing a thorough understanding of baseball. She once adeptly handled an inning of play-by-play, broadcasting over Cincinnati radio station WCPO in 1939.7 During the off-season, Scarsella worked at the same dynamite factory that employed his father. Additional activities keeping the ballplayer in shape included swing dancing and pickup basketball. Playing in 110 games with Cincinnati in 1937, Scarsella’s hitting fell to .246/.285/.331. In 1938 the Reds optioned him to the AA Newark Bears, where he hit .307 (.474 SLG) in 128 games, despite a serious case of pleurisy in July.8 Following his recovery, Les smacked a last-inning home run (his second round-tripper of the day), leading the Bears to a 9-7 playoff victory over the Rochester Red Wings. Newark repeated as International League champs, defeating the Buffalo Bisons four games to one in the playoffs. Recalled by the Reds in 1939, he hit a meager .143 as a pinch hitter in 16 games. On December 6 he was traded to the Boston Bees for pitcher Jim Turner. Scarsella looked forward to the start of spring training with his new club in Bradenton, Florida. Les, Ann and baby Elaine left California, driving east to pick up Ann’s cousin Virginia, who’d be accompanying them to Florida. Despite weather reports calling for trace amounts of snow, Les and the ladies headed south on the evening of February 6, 1940. Just outside of Lancaster, Kentucky, Scarsella’s automobile collided head-on with a coal truck. Les and 2-year-old Elaine suffered minor injuries in the crash. A seriously injured Ann was rushed to the hospital in nearby Danville, where she later passed away. Sixteen-year-old Virginia Vassil died at the scene of the accident.9 Funeral services were held in Cincinnati on Saturday February 10. Scarsella was hitting .300/.344/.417 in 18 games with Boston when his contract was sold on May 20, 1940, to the International League Buffalo Bisons. This seeming demotion motivated Les’s fierce determination to make a return trip to the major leagues.14 He hit a respectable .289 in 125 games with the Bisons, a Detroit Tigers farm team. Returning to the PCL in 1941, Les hit an impressive .322/.383/.440, in 170 games with the Seattle Rainiers. The team finished with the best record (104-70) in the loop, while en route to defeating the Hollywood Stars, 4 games to 3, to win the league championship. Back with Seattle in 1942, Les hit .267 in 167 games, prior to his contract being acquired by the PCL Oakland Oaks. Les enjoyed a fine season with Oakland in 1943, hitting .326/.384/.416 in 157 games. Major league baseball was intently watching, since fielding a competent team was greatly affected by the wartime player shortage. Scarsella was classified 3-A, exempting him from military service, due to a potential family hardship. Attempts were made to lure Scarsella back to the major leagues; however Les now stubbornly turned down lucrative offers, electing instead to remain in California. In 1944, playing 156 games with the fourth-place Oaks, Scarsella led the PCL in hitting with a .329/.382/.438 mark. 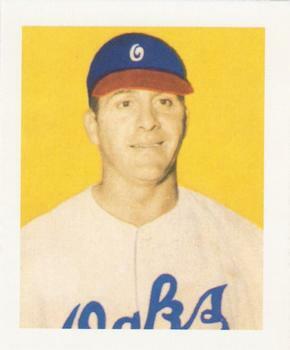 The Oaks’ player-manager was veteran Dolph Camilli, also serving as the team’s first baseman. Les was moved to the outfield, competently handling the corner positions. When a foot injury relegated Camilli to the bench, Scarsella returned to first base; he additionally posted an impressive 3-1 record on the mound, accompanied by a stingy 1.75 ERA. Major league clubs continued upping the ante in an effort to obtain Scarsella’s services. The Philadelphia Phillies offered to purchase Les for a tantalizing $40,000; Scarsella nixed the deal. New York Giants owner Horace Stoneham offered Oakland an astounding $100,000 (and two players) for Scarsella’s services in 1945, again to no avail. Scarsella’s contract with Oakland contained a right of refusal clause, allowing him to nix a trade if the following demands were not met: a two-year contract, with his salary doubled from $6,000 to $12,000; coast to coast travel reimbursement; and a guaranteed return to the PCL after the war.18 The package was just too excessive, so Les stayed put, enjoying another fine season with the fifth-place Oaks, hitting .325/.410/.496 in 139 games. A groin operation to repair a hernia limited Les’s playing time to 121 games in 1946. Despite the injury, Scarsella topped the league at .332, albeit without enough at bats to qualify for the batting title. Oakland improved to second under manager Casey Stengel; the ‘46 club made it through the playoffs, losing to the San Francisco Seals in the finals, 4 games to 2. Following a game against Sacramento on Thursday, September 17, a celebration was held in Les’s honor at the Hotel Leamington in Emeryville.19 He also celebrated his second PCL MVP award. Les’s playing time with Oakland was reduced to 89 games in 1947, as his hitting fell to a .255/.455 level. In 111 games with Oakland in 1948, Les contributed a .271/.341/.468 mark, helping Oakland to again become the PCL champs. According to Oaks manager Casey Stengel, “They called us the nine old men, but we showed ‘em.”20 This successful season opened doors for Stengel, who became the manager of the New York Yankees in 1949. Les remarried on January 12, 1949, tying the knot with Sacramento native Eleanor Holmes.21 The new bride previously worked for Oaks owner Brick Laws, fortuitously meeting Les at a company-wide Christmas party, held at one of Laws’s posh theatres. A lingering thigh injury led to Les’s release on June 29, 1949; at the time he was hitting .261/.340/.473 in 64 games. Scarsella retired; his totals covering 14 minor league seasons included 1,711 games and a batting line of .307/.314/.457. Additionally, he logged a lifetime mound record of 4-2, with a 1.43 ERA. In retirement, Les ran a popular tavern on San Pablo Avenue, located just across the street from the Oaks’ ballpark. Late in 1958, an ill Scarsella was admitted to the University of California Hospital for observation. He passed away on December 16 from an apparent heart attack.22 Interment took place at Oakmont Memorial Park, in Lafayette, California. In addition to his wife Eleanor, Les was survived by daughters Elaine and Linda Scarsella, Mrs. Anne Malone and stepdaughter Carole Dailey. Also surviving was his father John Scarsella, along with his brother and two sisters. Thanks to the helpful staff at the Baseball Hall of Fame for courteously sharing the content of Scarsella’s file. 1 Robert W. Creamer, Stengel His Life & Times (Lincoln: University of Nebraska Press, 1984), 202. 3 John Spalding, “Pacific Coast League Stars” (San Jose: John E. Spalding, 1994), 105. 5 HOF File, June 11, 1936. 6 “Scarsella Marries,” The (Sandusky Ohio) Register, September 27, 1936. 7 R. Cahan/M.Jacobs, “The Game That Was, George Brace Photo Collection,” Chicago: Contemporary Books, 1996. 9 “Scarsella’s Wife Killed En Route to Bees Training Camp,” The Lima Ohio News, February 6, 1940. 10 Alex Shults, “Scarsella is determined to Return to the Majors,” The Sporting News, March 27, 1941. 11 Biloxi Daily Herald, March 30, 1940. 13 The Sporting News, June 27, 1951. 15 Steven Goldman, Forging Genius, (Washington DC: Potomac Books, 2005). 234. 16 John Spalding, Pacific Coast League Stars, (San Jose California: John E. Spalding, 1994). 105. 17 Darrell Dryer, Les Scarsella Wins PCL MVP, The Sporting News, September 28, 1944. 18 Lester Rice, Scarsella KO’d $100,000 Deal, The New York Times, 1945. 19 Alan Ward, On Second Thought, Oakland Tribune, April 22, 1948. 20 Darrel Drexler, The Sporting News, October 6, 1948. 21 The Oakland tribune, January 12, 1949. 22 Hall of Fame File. 23 Sid Hoos, The (Haywood California) Daily Review, December 19, 1958.